As much as I genuinely enjoying putting my make up on in the morning, removing it in the evening is a ritual I enjoy just as much. Especially since I discovered the wise words of Caroline Hirons and took a really keen interest in what I put on my skin. First up, to take my eye make up and 4 coats of mascara off I use the Garnier Soothing 2 in 1 make up remover. I can't get this in Dubai so stock up in the UK when I am home and it's always on some kind of 3 for 2 in Boots and is cheap as chips anyway. Hands down the best drugstore bi-phase eye make up remover I have tried, it won't irritate sensitive eyes and does the job excellently. It will leave a greasy residue behind but my first cleanse washes that away. I am now a devout 'double cleanser/double toner' in the evenings. I love this current combo of cleansers and would definitely repurchase both. For my first 'make up removing cleanse' I am using the divine Oskia Renaissance Cleansing Gel (£28/100ml from Space NK-online only though, they no longer sell this in store). This is a light gel that transforms into an oil when massaged into dry skin. It's lightly scented with rose and chamomile and is infused with a cocktail of vitamins and fruit enzymes for a brighter, nourished complexion. Vitamins C and E nourish and protect the skin against environmental damage and pumpkin enzymes deeply cleanse pores and gently exfoliate. It's an all round delicious, soothing cleanse that takes off the days grime. Best emulsified with water and washed off with a damp flannel. I then pat my face dry before applying a generous amount of Elemis Tri Enzyme Resurfacing Facial Wash (£29/200ml from all Elemis retailers) again onto dry skin and massaging well. For my second cleanse I look for products with skincare benefits and this one works well for my combination skin type. This is a light creme/gel hybrid that aims to brighten the complexion using non abrasive, chemically exfoliating ingredients derived from the Larch Tree and Babassu Oil to lift away dead and dull skin cells. Yet it's still gentle enough for sensitive skins and can be used day and night. Avoid the eye area with this one and again rinse off with a damp flannel. I've already purchased a back up. This is really good value for money as well for a luxe brand like Elemis-200ml has lasted me the last 4 months and it's still going strong. I have talked about the benefits of double toning on my blog numerous times and you can read a post on the benefits here. My current line up is the much raved about Pixi Glow Tonic which I picked up in the UK as my exfoliating toner and the Origins Make a Difference Plus as my hydrating toner. So the PIXI Glow Tonic, in my opinion is a good 'starter' exfoliating toner for those new to the concept. Its £18 for 250ml and lasts forever so is a good buy. It contains a decent 5% Glycolic acid (click here for the benefits of Glycolic Acid) and contains other well known antibacterial and soothing properties such as witch hazel, aloe vera and Ginseng. It aims to tone, firm and tighten the skin and exfoliates without harsh grains. I don't like the smell, it's very chemical-ly to me but doesn't linger on the skin. I swipe this over my skin on a cotton pad and I think it works well. I still rate the Clarins gentle exfoliating toner as my holy grail but I have no real problems with this one. If you're not used to using acids on your skin to tone then you may find it better to first spritz the cotton pad with water to dilute the toner the first few times you use it. I always wait about a minute before I then go in with my hydrating toner. As I said in my current morning routine post the Origins Make a Difference Plus rejuvenating lotion this smells amazing-probably from the watermelon and lychee extracts-and you apply it by sweeping it over your skin with a cotton pad. When you first apply it to the skin it feels cooling and refreshing but also quite 'wet'. But it dries in under 30 seconds and leaves your skin primed and plumped ready for the next stage in your skin care routine. This sounds weird but I almost feel like this lotion acts like a magnet to hold your next product in your skin. Personally I love it and will definitely repurchase! Brilliant for drier and combination skin-I am recommending this to everyone at the moment but definitely those with drier skin will love it. As my final step in my skincare routine I alternate between two steps-the Chantecaille Retinol Intense and the Estee Lauder Advanced Night Repair serum. I would say these two products are perfect for 30's and 40's skin-they're anti-aging and nourishing. I wasn't sure about the Chantecaille Retinol Intense when I bought it. It was super expensive-£85 from Space NK but the bottle has lasted me almost 6 months and I seem to fall in love with it more every time I use it. This is a hybrid serum/cream targeting anti aging, pigmentation and stimulating collagen production. It has a relatively low percentage of Retinol (given the name states it is 'intense') and contains some very soothing ingredients such as Mallow, Evening Primrose Oil, Macadamia Nut oil and Jojoba Seed along with aromatherapy extracts of rose, jasmine and geranium. It smells so luxurious, lightly scented with rose and is a dream to apply. It's extremely light in texture and as the dispenser only dispensers a tiny amount on each pump I use about 5 pumps for my face and neck-but as I said, I have used this every other night for 6 months. It's very good at calming the skin and seems to stop any painful breakouts in their tracks. It's a great option for those wanting a light yet nourishing night cream. I wouldn't repurchase immediately, mainly because my skincare stash is overflowing but it's much better than I expected it to be and I do really love using it! The other 'last step' in my routine is the Estee Lauder Advanced Night Repair serum. Everyone and their dog raves about this serum which claims to dramatically improve all key signs of visible aging-reducing the appearance of lines and wrinkles, leaving skin feeling smoother, hydrated and stronger whilst looking younger, radiant, and more even toned. I like it but I don't feel like I love it. I think my expectations have been so high with this product that when I didn't wake up looking like Gisele after the first usage I was admittedly disappointed. Again, nothing bad to say about it but the Chantecaille cream feels like a very luxurious end to my cleansing ritual whereas the Estee Lauder tends to just get slapped on. I do use eye cream in the evening too-currently I am using the matching Estee Lauder Advanced Night Repair serum-a lovely light and refreshing serum that absorbs quickly and is great for reducing dark circles. So that's it-my current nightly ritual. 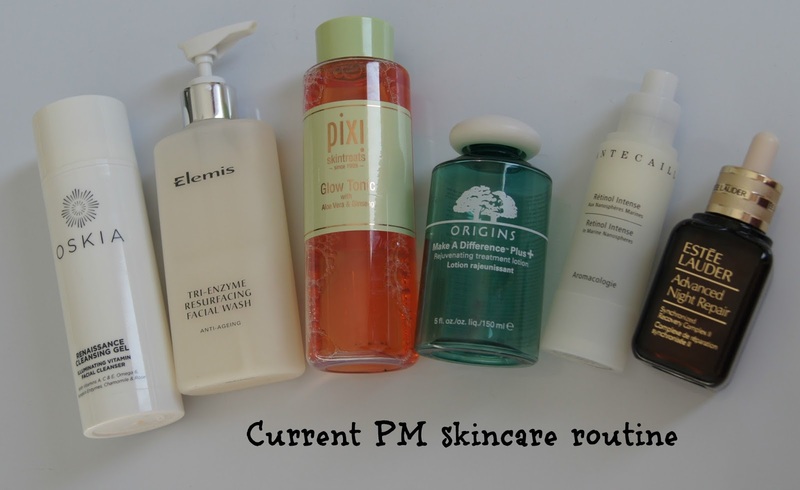 I am a total skincare whore and tend to switch up my routine regularly, not staying faithful to any particular brand or product but always finishing off what's open before trying something new! Do you use any of these products in your evening routine?